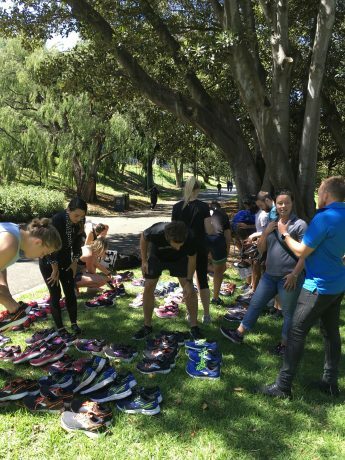 Ben from Pride Podiatry arranged for Hoka to deliver some of their wear samples and for the team at Brooks to meet us on the day with a large selection of their running shoe range. Brooks have recently changed the support system in their shoes, introducing the GuideRails support system. It was interesting to hear the changes that they have made and then try the shoes for ourselves. Brooks are one of the leading running shoe brands in Australia and worldwide and as a result, they lead the way in running footwear research and development. We then ran in some of the Hoka shoe range. Hoka shoes have skyrocketed in popularity in recent years, especially amongst the ultra running community. They have maximal cushioning with a rocker action to give you a smooth heel toe action on a small offset (heel drop) between the heel and forefoot. Hoka shoes sit at the opposite end of the spectrum to barefoot running and vibrams when it comes to cushioning. Everyone in the Pure team had their preferred shoe (and least preferred shoe) to run in based on comfort and this is supported in the literature. Research concludes that people move and run with a ‘preferred movement path’ regardless of footwear, but the effort changes, dependent on the footwear. People also use their own ‘comfort filter’ to select the shoe that feels most comfortable. Therefore, the right shoe for you is the one that feels most comfortable and allows you to move in your preferred movement path with the most efficiency. With everyone back in their own running shoes, we looked at the cues we give patients to help them modify and improve running technique during rehabilitation from an injury. 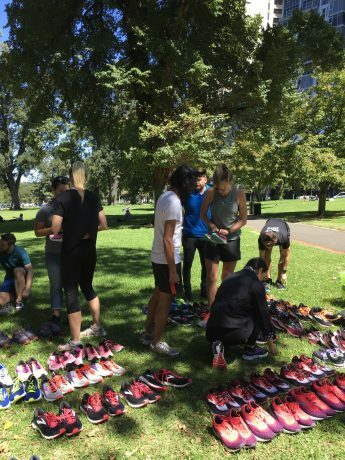 Everyone responds to cues differently and finding the cue that is right for an individual is the same as finding the right running shoe, based on individual preference. It was a great opportunity for us to step into the shoes of an injured runner and feel what it is like to modify your running technique in order to return to running pain free. A number of the team at Pure Physio have running events coming up in the next few months. They will be out there training efficiently, working on their running technique, cross training with appropriate strengthening exercises and maintaining appropriate mobility and flexibility. If you have a running goal and would like some advice or if you are suffering from a running injury and want to get back running, the team at Pure Physio and Pride Podiatry are here to help.